There was originally some speculation surrounding whether or not Apple would allow other developers to take advantage of the iPhone 4’s front facing camera for video calling functionality. However, it seems that Apple has not only allowed third-party video calling apps, but has already approved an update to popular messaging and VoIP client Fring making video calling capabilities over 3G on iPhone 4s a reality. While the video calling on Fring over 3G is reportedly not as smooth as Wi-Fi to Wi-Fi connections, understandably, it seems to be more than useable and definitely welcome by iPhone 4 users. 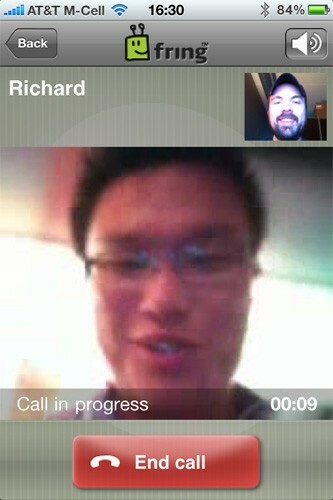 Many had originally thought Apple wouldn’t allow devs to take advantage of the front facing camera in the iPhone 4 in order to make sure there was no competition for Apple’s own video calling app, FaceTime. However, the fact that Apple has made FaceTime a standard for other device manufacturers to take advantage of is the reason we weren’t so surprised to see this latest Fring update approved. You can download Fring from the App Store here. I Like samsung mobile Phones very much. For Best Samsung Mobile Prone Prices Shop in India. Next Entry: 1.18 inch Apple Touchscreen Leaked- Could It Be a New Nano iDevice?